Paintwork contamination can come from industrial fallout, air particles, dirt particles, tar, and animal droppings. Exterior detailing involves cleaning and bringing a shine to the car’s paint, chrome trim, windows, wheels, and tyres. Cleaning refers to removing all foreign surface particles from exterior surfaces through the use of special materials and cleaning agents to clear away the paintwork of contamination. Correcting refers to using mechanical polishes by hand or with a machine and specific polishing pads that remove a fine layer of paintwork from a vehicle to remove fine scratches and swirls from a paint surface. Protecting involves the application of a protective material that prevents foreign matter from adhering to the surface of the vehicle, including water, bugs splatter, tar, and dirt. Waxes and sealants provide this barrier against the elements. 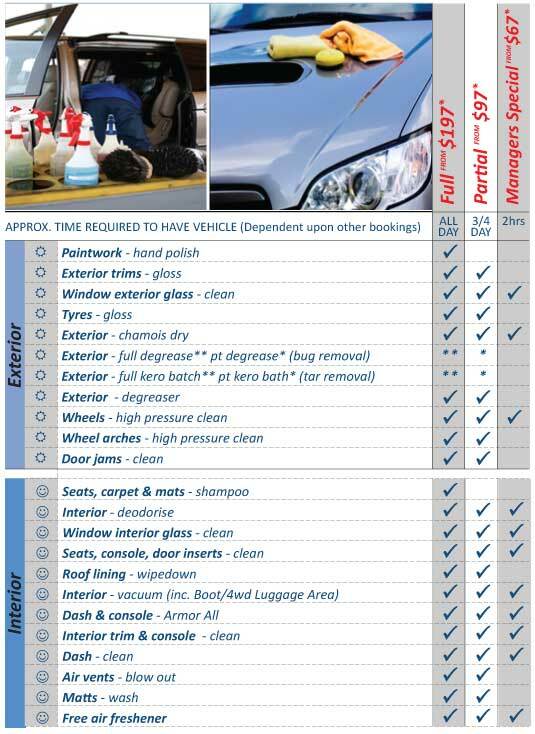 No Matter how clean and tidy a person is the car surfaces in the passenger, luggage and boot compartments become soiled from day to day use. Vacuuming – removes the built up dirt, hair and food particles. Stain removal – removes deep stains from spills. Shampooing – deep cleans to remove deep dirt. Dusting – brush and air blow to remove dirt from crevices and vents. Cleaning – apply liquid cleaners to wipe down. Protecting – apply protectants to maintain suppleness and protect from UV light. Vacuuming – removes the built up dirt and rubbish. Protecting – apply protectants to maintain suppleness and protect from UV. Cleaning – removes built up. Treating – applying fog inhibitors (optional). Treating – applying water repellents to glass (optional).